I had jitters when I flew out from Singapore. Just felt that something was not right. Was it training? Or did I forget to pack something? Or gotten the wrong dates for accommodations? I dun know. Or maybe it was a little of each of them. Then I noticed. I had reached Seattle International Airport at 10am on 15 Aug (Fri) and my connecting flight to Denver International Airport only leave at 3pm that afternoon! Goodness! I had almost 5 hours to spend at the airport! To save $$$, I took a rest at the United Lounge at the Airport and watched the delayed telecast of the Olympics games. A great way to past time and a good choice to get your energy pump for Sun's run as well. Then at 3pm, the unthinkable thing happened! Something was wrong with the jet and there would be delay. This was bad. Cos any delay would mean that I would reach Denver beyond 7pm and I would still require to drive another 2 hours to get to Manitou Springs! I waited with the other disgruntled passengers and the jet was finally serviced and ready to fly at almost 10 minutes to 7pm. By the time I reached AVIS in Denver, it was 11.25pm. I decided to rent a unit of the GPS so that I won't have to worry about getting to Manitou Springs and the GPS was certainly a big help! While driving, I noticed that it was drizzling. Not a good sign at all. But there was not much traffic as it was almost midnight and I pulled up at the motel around 12.40am on 16 Aug (Sat). After settling in, it was 2am! Hope I could get up in 4 hours time so that I could drop by the Pikes Peak Ascent (the half marathon) which would be flagged off at 7am and 7.30am in 2 waves. 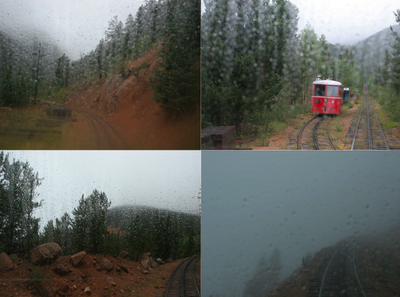 The train pulled up minutes before 10.30am and promptly left for Pikes Peak at exactly 10.40am. It was still drizzling and you can see fog covering the top of Pikes Peak. Visibility was poor although I enjoyed the cool morning (with the exception of rain). Towards the 2nd half of the railway ride, the weather seemed to get worse after it had actually stopped drizzling for a while. There, you could see the train climbing hard past the thinning treeline. By now, visibility was even poorer and you couldn't see more than 20 metres. The ground was also covered with snow! Oh my god! SNOW! What would happen to the runners! I shivered whenever the thought flashed across my mind and for that moment, my knees felt weak! 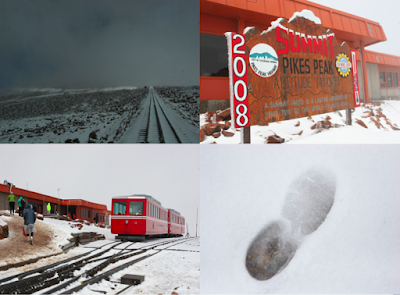 I held my breath, occasionally while marveling at the picturesque scenery or while taking pictures of way up Pikes Peak, but most of the time, I allowed my fear of the terrible, wet weather consumed me. Absolutely no words could described what I saw and felt when I eventually reached the top of Pikes Peak! [See above pictures to get a clearer idea.] Okie okie, I had to agree that my command of english is not as good as some but I was really speechless. Here I was, on top of Pikes Peak which was 14,115 ft above sea level. The views was fantastic. All of the 360 degree round the breathtaking Peak. The snowing had stopped but you know it snowed as the ground was covered with at least 5 inches of thick snow! 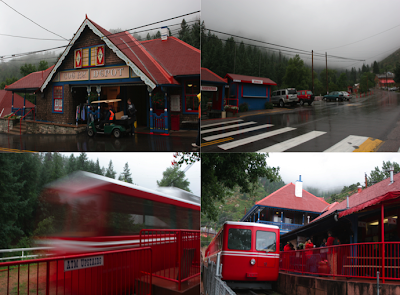 All the passengers on board the Pikes Peak Cog Railway Train were ecstatic. I was too until I saw the baggages of the Ascent runners, laid out on the snow-filled benches. You have to give credit to all these runners as well as the volunteers! I also saw some runners walking towards the cafe. Most looked tired but relief that they had completed the Ascent. 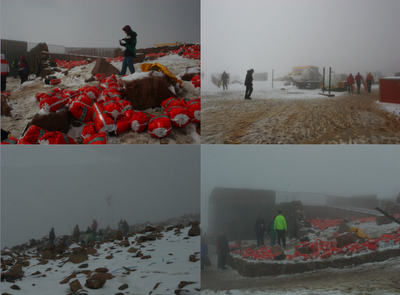 Then more news come through: I learnt from some of the volunteers that about 800 runners were turned back from the A-Frame (last aid station with a cut-off time just before the treeline ends) due to extreme bad weather condition. Apparently there would be lightning and more snow. So, instead of running just 13.1 miles up Pikes Peak, these slower runners had to be turned around. And when you were up that high with no way to reach the top, you just had to go all the way back on foot, about 20 miles in total (start to A-Frame was about 10 miles up). Well, you could say that its value for money but when you were out in the cold, the last thing you want is to run more than what you had planned and trained for. Uuuurrrrgggghhhh!!! Bitter cold and low oxygen levels. 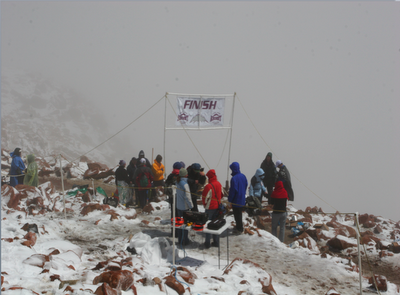 What tough conditions for runners to complete a marathon... amazing! Decided to share my running journey and holidays via the blog community with fellow like-minded runners. To begin, I was on the run since 1983 but started running more regularly since 1994 due to work requirement when taking part in the annual Army Half Marathon became a regular fixture. However, I needed a bigger challenge than running just the AHM and hence, the progression to the Marathon distance in 2001, and the Ultra distance in 2006. Have DNFed 35 ultras, but completed 76 marathons, 53 ultras caa 30 April 2017.